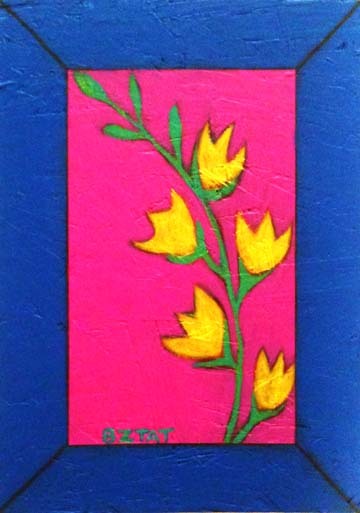 Spring Fling 2013 Art Auctions are live! The auctions for the artworks created in yesterday’s Spring Fling 2013 Create-a-Thon are now live! Each artwork has its own bidding page. Please do not leave bids in the comments of this post. Click on the images of the artwork below for which you’d like to bid. Simply leave your bid in the comments on the artwork’s bidding page, and keep checking back to see if others have made bids after you. There is a “Buy Now” option for each piece. You can buy the piece now for the stated “Buy Now” price as long as no bids have been made before you. Simply write BUY NOW in the comments and the piece is yours for $125 + shipping. NOTE: If you have artwork currently on order (excludes Etsy orders), or you plan to attend the BlogPaws conference, there will be no shipping costs for any artwork you purchase from these Create-a-thon auctions. I will either include it with your existing order free of charge, or I will deliver it to you at BlogPaws. These artworks all can fit in a suitcase! Bidding will conclude on Sunday, May 12, 2013 at 10 pm ET. Winning bidders will need to allow 4 weeks for shipping. Thanks for your support of the auction. Happy bidding! Click on images to get info on each artwork and to make bids. It's time for a Spring Create-a-thon! It’s Spring and the weather in Ohio has been fabulous! If you know anything about Ohio, you know that FABULOUS is rarely a word used to describe the weather. To celebrate our great fortune, I am going to have a Spring Create-a-thon tomorrow (Friday, May 10)! What is a Create-a-thon? A Create-a-thon is an event where I create artworks in my studio for 12 hours (9 am – 9 pm) and make them available for auction the following day. The works created during the Create-a-thon will be auctioned to raise money for my annual trip to BlogPaws, the best pet blogging event in the world, and my cats’ ongoing veterinary costs. I was lucky to win a contest that covers my registration and room for the conference, and Embrace Pet Insurance is helping me with the travel. But there are always other expenses. Also, Slick has another vet visit when I return, so some extra cash for that will also be helpful. Some of the artworks will be paintings, some drawings, and maybe a surprise or two. Be watching my posts on Facebook and Twitter to see the works in progress throughout the day, and be ready to bid on Saturday! By the way, if you have artwork currently on order, or you plan to attend the BlogPaws conference, there will be no shipping costs for any artwork you purchase from the Create-a-thon. I will either include it with your existing order free of charge, or I will deliver it to you at BlogPaws. These will all be artworks that can fit in a suitcase! The Mystery of Cats Create-a-thon Auctions are LIVE! Note: if you receive an Internal Server Error message when trying to go to a new page, please just go back and try again. If that does not work, contact me. We are trying to work out whatever bug is causing the problem. Thanks! The auctions for the artworks created in yesterday’s Create-a-Thon are now live! Bidding will conclude on Sunday, October 21, 2012 at 10 pm ET. Proceeds for the auctions will go towards my latest Okey’s Promise: Art for a Cause Project.